229 in stock Need More ? 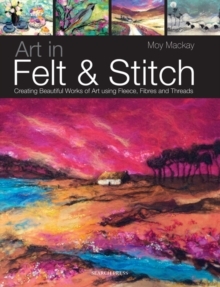 In this visually stunning book, Moy Mackay reveals how you too can create beautiful pictures using felt. Characterised by her wonderful use of colour, Moy's work is breathtaking and includes still-lifes, animals and landscapes inspired by the dramatic scenery of the Scottish Borders where she lives and works. Moy takes you through every step of the process, including the materials and tools you need, the feltmaking process itself (which is easier than you'd imagine), and how to put together four fabulous felt paintings of your own. There is guidance on stitching, including both hand- and machine-stitching, as well as how to use colour and introduce texture in the form of different fibres and threads. There are numerous examples of Moy's work through the book, and by the end you will not fail to be inspired to create gorgeous felt paintings of your own. "Moy's passionate use of colour and the deep texture created by felting are what draw me to her work.